As an ephemeral form of commemoration, a memorial’s unveiling is an opportunity for communities to gather and formally acknowledge or ‘accept’ it into their landscapes. As most New Zealanders were unable to visit the battlefield memorials, it was left to a select few to represent the nation at each ceremony. Unveiling of the New Zealand battlefield memorial at Messines. The unveiling of the battle exploit memorial at Messines was a major event for the community, attended by most of the local population, including 250 school children and many of the officials who had liaised between all the interested parties throughout the process. The opportunity for strengthening diplomatic ties was an important part of the unveiling ceremony. In his speech Sir James Allen emphasised that in addition to the success of the 1917 capture of Messines, the memorial stood as a symbol of unity between Belgium and New Zealand. In a newsreel of the event, Seager can be seen helping to remove the New Zealand flag from the memorial and, later, being presented to King Albert. For this image, the photographer, of the Ypres-based photography studio Antony d’Ypres, has moved back some distance (possibly to use the top of one of the pill-boxes for extra height) to show how the large crowd took up most of the site’s space. 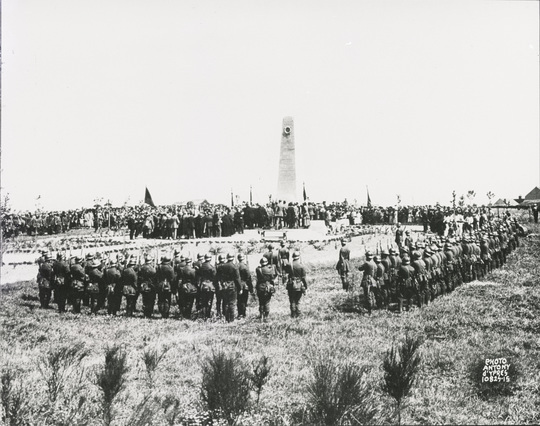 The spectacle of 260 Belgian soldiers surrounding the monument in formation lends more gravitas and heightens the sense of a wide acknowledgement of the local community for the New Zealanders’ efforts. Small clips visible on the full glass plate negative (from which this image comes, rather than a lantern slide) and the photographer’s mark in the bottom right corner suggest that Seager rephotographed a printed copy to produce this plate. From this he could make a contact print to produce a lantern slide. Visitors waiting for the unveiling ceremony to begin at the New Zealand Battlefield memorial on the top of Chunuk Bair. This photograph records the first ‘official’ pilgrimage of visitors to the newly completed monument at Chunuk Bair. 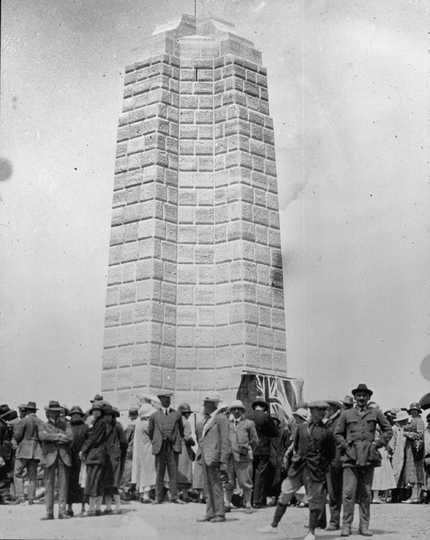 The camera has been positioned to show the full height, texture and form of the monument, with the crowd milling around its base. It’s a ‘before’ shot of the event with the New Zealand and British flags still covering the inscription stone, later to be unveiled. A full account of the day was reported in the New Zealand and Turkish newspapers, describing the journey of some 400 “British pilgrims” (mostly New Zealand, Australian and English citizens) to the remote Chunuk Bair hill, after visiting other significant battle sites on the way. They had arrived at peninsula on the Ormonde. Some of the visitors would have been relatives of the fallen, but there were also officers who had served at Gallipoli, Turkish and British officials, and more than a hundred local drivers who had transported everyone there in pony-led carts. The people in this image are dressed in their best, wearing hats, stockings, waistcoats and coats, the heat from the sun notwithstanding. As for the Seagers, they were in New York for a town planning conference. Seager said that missing the ceremony was “one of the greatest disappointments of his life”. How he obtained a copy of this image is not known, yet some markings and the mask suggest that he rephotographed a printed image to make this lantern slide, probably cropping out more of the crowd and any identifying marks of the photographer.